You are here: Home / Mold and Mildew in many areas of your home. If you have a moist basement, then you know you have mold. If you smell a moldy odor, then you know you have mold! The odor of mold indicates there are thousands of live mold spores floating in the air. These spores may be breathed in and cause illness, or aggravate preexisting respiratory conditions. Untreated mold can make you permanently ill, and devalue your home. Germ Doc.™ kills the mold, black mold, and other offensive bacteria by helping to kill the offending organisms. Germ Doc.™ fogged into rooms can safely kill mold spores, airborne spores and sanitize infected areas. With the process, you will purify the air and eliminate mold odors. Germ Doc. ™ is our EPA registered mildew stat that kills mold and mildew, spores and fungi (quaternary disinfectant). Kills gram-positive and gram-negative bacteria. Contains four top-quality quats plus other ingredients for complete disinfectant, which meets O.S.H.A requirements. Mildewcidal: Use full strength. Germ Doc™ will effectively inhibit the growth of mold, mildew and the odors caused by them when applied to surfaces. Germ Doc™ can be used on anything that water-based cleaners can be used on. Do not mix Germ Doc™ with water or cleaners. Allow drying on the surface. Germ Doc™ will help with most allergy problems. Fungicidal: Use full strength. Effective against trichophyton mentagrophytes (athlete’s foot fungus) when used on surfaces in areas such as locker rooms, dressing rooms, shower, bath, and exercise areas. Bacterialcidal, pseudomonicidal, staphylocidal, tuberculocidal, virucidal. Recommended for use in: hospitals, nursing homes, schools, colleges, public restrooms, veterinary clinics, dental office and laboratories, food processing plants, pet shops, kennels, breeding and grooming establishments, airports, hotels and motels, confined animal houses, households (kitchens, sinks, bathrooms, pet areas or just any where). Lightly and evenly mist bedding and pillows to stop the spread of colds and flu. Directions for use: Apply full strength to walls, floors and other hard surfaces such as tables, chairs, lawn furniture, countertops, sinks, bathtubs, toilets, urinals, tiles, hampers, porcelain and bed frames. Allow to dry on the surface and repeat if mildew growth returns. Easy to use, no mixing, apply full strength to the surface with a sprayer. Allow remaining wet for 10 minutes; let air dry or wipe dry. Germ Doc. ™ is odorless, so no one even knows you’re using it. Always use Germ Doc. ™ to clean kitchen counters after cutting up meat and poultry so you will not have to worry about ecoli or salmonella. Clean bathrooms and showers with Germ Doc™, No need to rinse. Dry very fast with fans. One gallon for 300 sq. ft.Mold needs three things to grow: Moisture, a nutrient, and a warm environment over 60 degrees. The nutrient might be wallboard, wood studs, or even dead dried mold itself. This is why spraying mold with bleach is only a temporary solution and then you have to put up with the bleach smell. Once the moisture and heat return the mold can begin growing again. Germ Doc.™ can kill mold in a 10 minute, even the loose spores you cannot see, in places you cannot see when fogging. That’s why it can be a much more complete cure than just using a bleach solution alone which does not help. 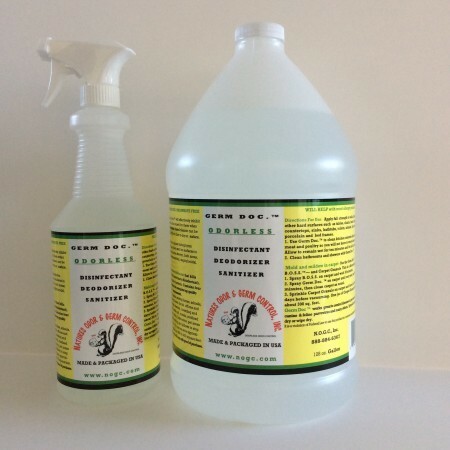 Disinfecting: Use full strength, to disinfect hard non-porous surfaces. Treated areas must remain wet for 10 minutes. Let air dry or wipe dry. Sanitizing: Use full strength, to sanitize porous or non-porous, non-food contact surfaces (floors, walls, tables & etc.) allow 10 minute contact time. Let air dry or wipe dry. Germ Doc. ™ is effective for disinfecting of hard surfaces in presence of moderate amounts of organic soil. Apply Germ Doc. ™ full strength with any type of clean sprayer. Germ Doc. ™ may also be used in a cold mist atomizer for disinfecting hard to reach areas, such as crawl spaces or heating and air conditioning ducts. Fungicidal: Use full strength. Germ Doc. ™ is effective against Trichophyton mentagrophytes (athlete’s foot fungus) when used on surfaces in areas such as locker rooms, dressing rooms, shower-bath areas, exercise areas and etc. Mildewcidal: Use full strength. Germ Doc. ™ will effectively inhibit the growth of mold, mildew and the odors caused by them when applied to hard non-porous surfaces. Allow drying on the surface. Repeat as necessary. Stachybotrys Chartarum (Toxic Black Mold) is a greenish black fungus found worldwide. It colonizes in most building materials including, drywall, carpeting, wallpaper, fiberboard, ceiling tiles, and thermal insulation. The fungus can be wet and slimy to the touch. There are about 15 species of Stachybotrys world-wide. This toxic mold grows in an area that experiences a period of high moisture. Wherever you live, this black mold could be found in your home. Molds reproduce by making spores that cannot be seen without magnification. Mold spores waft through the indoor and outdoor air continually. Aspergillus niger is a type of mold widespread in indoor environments. It causes breathing problems and skin infections. A one time flood can lead to a permanent mold problem. Mold can be killed and it’s growth retarded by Germ Doc.™. Mold will NOT go away on its own. Prevent damage to building materials and furnishings, save money, and avoid potential health risks by preventing mold growth Mold and mildew grow in dark and humid places where there is a lack of oxygen. Molds produce allergens that can trigger allergic reactions, and asthma attacks in people who are allergic to mold. If mold grows out of control for a long period of time, the only solution may be condemning the property and burning the structure to the ground. The reduction of moisture, the killing all visible mold with Germ Doc™ is the best way to combat a mold problem. Fogging Germ Doc™ may be a necessary treatment to kill the mold in your home. IONIZERS OR AIR FILTERS WILL NOT KILL MOLD SPORES! IONIZATION may make the air smell fresher, but it is not an organism killing bactericide in the way that Germ Doc.™ is. Germ Doc.™ is the best way to truly remove mold odors, and retard mold growth by killing the mold and mildew. IONIZATION is NOTHING MORE than static electricity, and it has no organism killing ability. In fact, if you use ionization to try and control mold, the negative ions will drive the floating mold spores to your walls, floor, and ceiling. Six months after you start using an ionizer you will have MORE mold spores and bacteria collected in your home than before you started! Mold testing has proven this fact. Ionizers make a mold problem WORSE! Untreated mold WILL NOT go away on its own! It will continue to grow and infect your home! Remove as much of the moisture and humidity in the room as possible. Turn up the heat and make the area as dry as possible. Use a dehumidifier if one is available. Once the mold and mildew are killed by the Germ Doc.™ the surfaces that can be cleaned with Bacterial Odor and Stain Stopper (B.O.S.S.) and water should be washed. The wearing of protective clothing, including gloves and a breathing mask, is strongly advised. Do not touch the mold with your bare hands. Remember there is no such thing as “harmless mold”. Any mold can threaten health, so please be very careful when removing fungi molds. The amount of Germ Doc.™ and length of treatments required depends upon the size of the room, and the level of mold contamination. The more mold that is in a room, the higher the Germ Doc.™ concentration must be in the room in order to kill the mold spores. It is important to use as much Germ Doc.™ as possible to shock a room. The mold spores may be persistent and more than one treatments may be necessary. After a series of treatments, the area will then smell fresher, and much of the mold will have been eliminated. If mold odors reoccur this indicates there are still mold spores in the air. Additional Germ Doc.™ be necessary to eliminate these odors. Mold Spores need three things to grow: Moisture, a nutrient, and a warm environment over 60 degrees. This is why spraying mold spores with bleach is only a temporary solution and a waste of time and money. Will Ozone Kill Mold Spores In Walls? No, NOTHING is going to kill mold spores inside an enclosed wall, no matter what anyone tells you. While some companies claim to have products and special ozone generators that will magically work through walls, it simply isn’t true. Many of these companies have been sued by the government for making such ridiculous claims. If there was a way to kill mold spores within walls we would gladly sell such a product since we are asked about this type of problem every day. The way that you kill mold spores inside a wall is to remove the wallboard and blast behind it with very high Germ Doc.™ treatments. The wallboard must be removed and the open area must be blasted with o Germ Doc.™, preferably many times. Just cleaning the area out with bleach or fungicides is not enough to make sure all of the mold is killed. You must make sure the mold is 100% dead or when you rebuild the mold spores may start to reproduce within the wall cavity and a few months later. Soon you could have the exact same mold problem that you started with. We hear about this exact situation almost every day. into it to kill mold spores behind the wall? There are studs every 16 inches apart, as well as cross members behind each wall. To get behind all the separate cavities one would have to make 8 or more separate holes in the wall and that STILL not kill all the mold spores behind them. That’s why the walls must be removed if you want to kill the mold spores behind them. It does not make sense to cut 8, 12, or 20 holes in your walls to inject the Germ Doc.™ inside them. Besides, the wallboard itself is most likely infected with the mold spores inside its core so it is going to have to be replaced anyway. The solution is to remove the entire wall, clean out any mold and mold-infested insulation and nail up new wallboard. Of course, it is strongly recommended that Germ Doc.™ be used in this mold remediation process. Some people ask us if they are going to open up the walls and rebuild anyway why bother using Germ Doc.™ at all? The answer to that is very simple. One must make 100% sure that all the mold spores are killed behind a wall before they ever rebuild, or they leave the very real possibility that the mold will start growing behind the walls in just a short time once again.